Carillon at Stonegate in Aurora, Illinois is an option for people seeking an active adult community in the Naperville-Aurora area. With only 336 homes, Carillon at Stonegate is considerably smaller than nearby Carillon Club in Naperville and Carillon Lakes in Crest Hill. 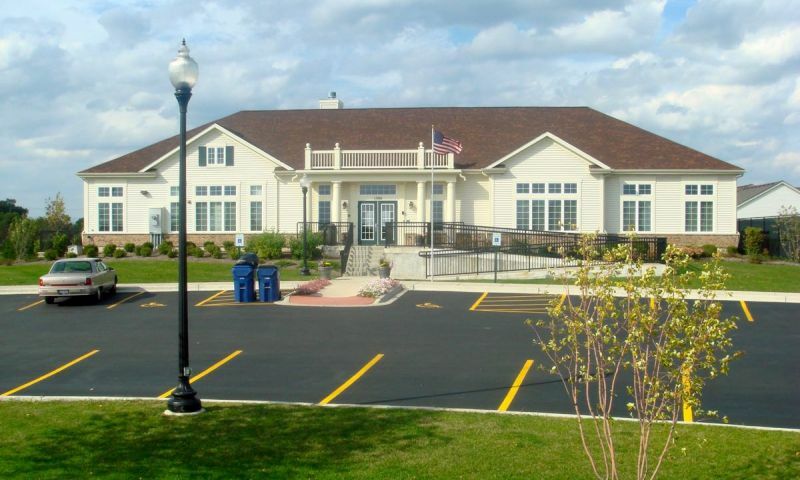 It is also a great alternative for those who do not require a Naperville address (or Naperville prices), but still want an active adult community that is in a great location just seven miles from downtown Naperville and two miles from I-88. Despite its smaller size, the amenities and lifestyle found in Carillon at Stonegate in Aurora is comparable to most other nearby 55+ communities. In addition to the amenities, Cambridge Homes has built a delightful array of reasonably priced single-family homes that has made this intimate neighborhood a favorite with many Chicago area active adults. The main attraction at Carillon at Stonegate is an 8,000 square-foot clubhouse. This two-story amenity center plays host to many of the community events while also serving as the focal point for social clubs and fitness activities. The clubhouse is complete with an outdoor pool, fitness center, hobby and game rooms, library, computer room, aerobics studio and ballroom. Outside of the clubhouse, residents can enjoy a tennis court, walking trails, small fishing pond and bocce ball courts. Bike enthusiasts will enjoy a regional Prairie Path bike trail that passes along the boundary of Carillon at Stonegate providing access to hundreds of miles of bike paths throughout the Chicago suburbs. Carillon at Stonegate has nine single-family ranch floor plans ranging from 1,402 to 2,332 square feet. Homebuyers can select from resale homes for sale in Carillon at Stonegate in Aurora. All of the homes feature at least two bedrooms, two baths and two-car garages. Some of the plans include an additional third bedroom, den or second story with a loft. All homes come standard on a slab but basements are optional on all of the homes in Carillon at Stonegate. Carillon at Stonegate has a lifestyle director who helps coordinate many fun activities, clubs and classes. There are over a dozen clubs and interest groups that include card clubs, board games, bocce ball, book club, ceramics and cycling to name a few. Plus, residents can participate in various neighborhood events or day trips to many local destinations in the suburbs or downtown Chicago. Carillon at Stonegate is located on Indian Trail Road directly between East Nola Road and North Farnsworth Avenue in Aurora. The community is 40 miles west of Chicago along I-88, at the Farnsworth Avenue exit. The community is then one mile south on Farnsworth and one mile east on Indian Trail Road. Downtown Naperville is just 7 miles from the community and offers great shopping, restaurants and the Riverwalk. Just outside of the community, residents have access to a Jewel-Osco one mile away and countless shopping opportunities such as the Fox Valley Mall along Route 59 only four miles away. Clubhouse - 8,000 St. Ft. There are plenty of activities available in Carillon at Stonegate. Here is a sample of some of the clubs, activities and classes offered here. The Resort Series single-family homes are offered in nine floor plans. These thoughtful designs offer open layouts that include spacious family rooms, expansive kitchens, dining rooms and living rooms. All homes are single-level except for the Sundance and Sun Valley models. Additional options such as sunrooms, extended family rooms and basements provide for even more space. The association maintains all lawncare, snow removal and landscaping but homeowners are responsible for maintaining the exterior of their homes. Homes in Carillon at Stonegate are available as resale homes. moved in not even a year ago. so happy with our choice to buy in Carillon at Stonegate. we have made so many new friends, it was easy because everyone is very friendly. there are so many fun activities. nice to walk in the neighborhood. we feel safe here and really enjoy our new home. so convenient to everything. highly recommend this easy and fun lifestyle. Purchased a resale house one year ago. The residents are very friendly and there are many activities if you want to be an active participant. Great location to shopping, restaurants, hospital, and churches. HOA fees cover all landscaping and snow removal. Highly recommend. My home in this community is such a blessing! And, the activities and other residents really make living here fun. I LOVE the work out room! It was a perfect choice for me as a widow. I lived here for two years and now remarried, so am moving. I will miss Joan, who is a tremendous help with everything, many residents who became friends, fun activities and especially my peaceful, wonderful home. Carillon is a nice little community. We like the smaller size and that it is still close to many of the places we like to go on a regular basis like Naperville, Wheaton and Geneva. We are very pleased with our new home. 55places.com is not affiliated with the developer(s) or homeowners association of Carillon at Stonegate. The information you submit is distributed to a 55places.com Partner Agent, who is a licensed real estate agent. The information regarding Carillon at Stonegate has not been verified or approved by the developer or homeowners association. Please verify all information prior to purchasing. 55places.com is not responsible for any errors regarding the information displayed on this website.